Growing up as the daughter of Egyptian immigrants, I lived in two worlds simultaneously. I was Priscilla at school and Briskella at home. I shared American Christmas with my friends and Egyptian Christmas (January 7th) with my family. I even had two Sweet 16 parties, one for my school friends and another for my Egyptian community. At a young age I learned how to code switch and compartmentalize my different identities. But as I grew older and became more mature, I slowly allowed these two worlds to converge. I started sharing more of my Egyptian side—the music, the food, the politics, the history—with my American friends, and vice versa. I let people see my whole self, knowing not everyone would accept it, but the ones that did I could truly call friends. 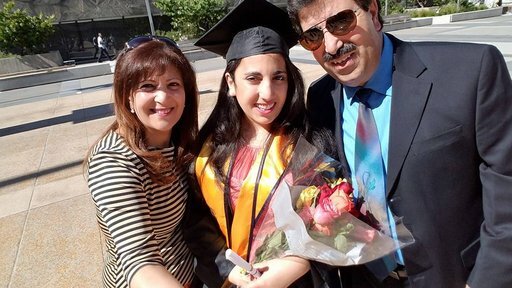 Priscilla and her parents celebrate her graduation from U.C. Berkeley. That personal journey prepared me well for becoming a Peace Corps Volunteer. Integrating into my new village in southern Guinea was a fairly comfortable process because I had spent my entire life learning how to understand and navigate different cultures. I’m far from an expert on Guinean culture, but I’ve learned to take the good along with the bad in every society. No matter your background, we as human beings have much more in common than not. When I first met my host family and could not speak a word of French or the local language, I immediately turned to the universal language of music. My host family and I bonded over our shared love of Rihanna; I played her and other favorite American music, my host family played me their favorite Guinean songs and we spent our nights dancing. I explained my ethnic origins to them because I had heard that many Guineans have an image of America as all white people with blonde hair. Despite this possible preconception, my Guinean host family immediately understood that America is a place where people from all parts of the world converge. And that anyone, no matter their origin, can become an American. Priscilla with her Guinean host family. Being brown in America also prepared me for being a novelty to the people around me in Guinea. Here, there are various terms for foreigners, including “fote,” “porto” or “tababou.” These phrases essentially all mean “stranger” but, depending on the context, the words can mean different things. Tababou can be an expression of curiosity—like when children yell tababou as you’re walking down the street. Or it can be a good-natured jest—like when my best friend in Guinea jokingly called me tababou after I was unable to carry the water bucket on my head. And, of course, it can be hostile—like when my taxi driver called me the name after we argued over the price. In all these situations, the term means that you are a stranger and not one of "us." As an ethnically ambiguous brown person in the U.S., many times I’ve felt like a tababou in my own country. Like when curious strangers ask, “What are you?” as I’m walking down the street. Or when my somewhat insensitive friends asked me to belly dance for them. Or the time in college when a bigot ranted and cursed at me as I was on my way to class. 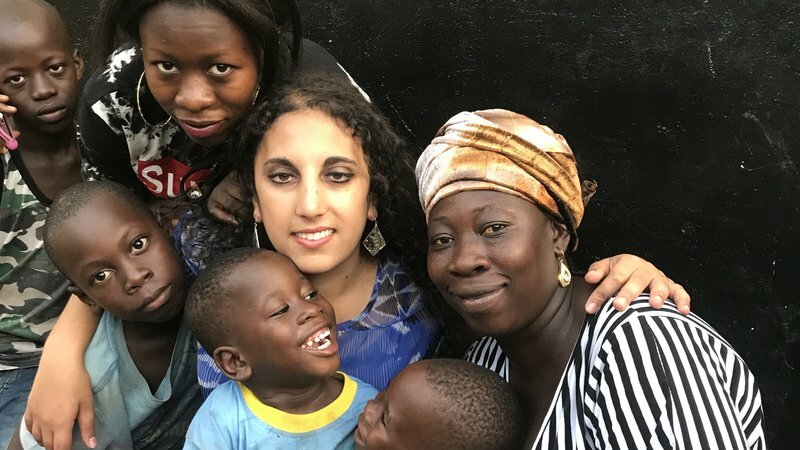 I came to Guinea thinking I was representing America’s diversity to Guineans; now I see that I’m also doing it for the sake of my fellow Americans. My presence here is a small reminder that I’m as American as any other U.S. citizen, and I serve my country with pride, even though many of my fellow citizens still see me as tababou. Representation matters—but it’s not why I’m here in Guinea. I came here to work. During my three-month in-service training, I started a women’s literacy class that’s still continuing six months later. In the six months I’ve been at my site I’ve introduced income-generating activities, like soap-making; I’ve gone door to door explaining the cause of malaria and the importance of sleeping under mosquito nets; I have collaborated with my community to start a tree nursery that will eventually benefit the entire community. Along with all these projects, I teach English while learning two languages from scratch. I’m proud of my Egyptian heritage and I’m proud to be an American—but I’m most gratified by what I am slowly accomplishing here. I believe my work speaks for itself. Priscilla Ibrahim is an agriculture Volunteer in Guinea. She has a B.A. in peace and conflict studies from U.C. Berkeley.